The best NASA books are those written by military heroes who doubled as NASA astronauts. Check them out! Expedition 1 Commander Bill Shepherd (center) is flanked by Soyuz Commander Yuri Gidzenko (right) and Flight Engineer Sergei Krikalev (left) in this crew photograph. 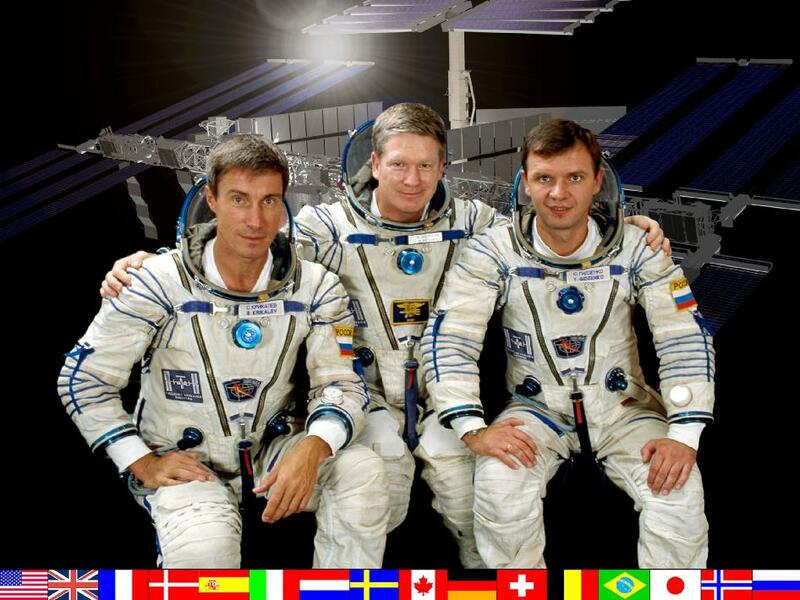 The three, seated in front of an artist's concept of the International Space Station, are wearing the Sokol space suits like those donned for trips in the Soyuz to the station. National flags representing all the international partners run along the bottom of the portrait. Expedition 1 was the first crew to live aboard the orbital platform and launched to the station on Oct. 31, 2000. For information about Space Florida, visit http://www.spaceflorida.gov. For information about NASA's Kennedy Space Center, visit http://www.nasa.gov/kennedy. For more information about NASA's commercial transportation programs, visit http://www.nasa.gov/exploration/commercial/index.html. WASHINGTON -- The following is a statement from Bill Gerstenmaier, associate administrator for Human Exploration and Operations at NASA Headquarters in Washington, on Sunday’s launch of the Progress 45 spacecraft to the International Space Station. The rocket lifted off from the Baikonur Cosmodrome in Kazakhstan at 6:11 a.m. EDT (4:11 p.m. Baikonur local time). "We congratulate our Russian colleagues on Sunday's successful launch of ISS Progress 45, and the spacecraft is on its way to the International Space Station. Pending the outcome of a series of flight readiness meetings in the coming weeks, this successful flight sets the stage for the next Soyuz launch, planned for mid-November. The December Soyuz mission will restore the space station crew size to six and continue normal crew rotations." The best NASA books are the ones written by military heroes who became NASA astronauts. On Friday, Oct. 28, 2011, an arc of light illuminates the pre-dawn sky at Vandenberg Air Force Base, Calif., as a Delta II rocket launches with the NPOESS Preparatory Project (NPP) spacecraft payload. NPP carries five science instruments, including four new state-of-the-art sensors, which will provide critical data to help scientists understand the dynamics of long-term climate patterns and help meteorologists improve short-term weather forecasts. For more information about NPP, visit http://www.nasa.gov/npp. For more information about the ELaNa III mission, visit http://go.nasa.gov/tgbuVn. CAPE CANAVERAL, Fla. -- Journalists are invited to attend a major announcement of a new partnership between NASA's Kennedy Space Center in Florida and an outside organization that will open NASA's facilities to U.S. commercial space launch service providers, create jobs and help American companies regain leadership in the global space economy. The announcement will take place on Monday, Oct. 31, at 10 a.m. EDT at NASA Kennedy's Orbiter Processing Facility-3 and will be carried live on NASA television. The new partnership was developed following a Notice of Availability NASA issued in January. The notice was used to identify interest from industry for space processing and support facilities at Kennedy. These facilities have become available for space-related commercial use following the end of the Space Shuttle Program. Journalists must arrive at Kennedy's Press Site by 9 a.m. for transportation to the event. Journalists without NASA Kennedy accreditation need to apply for credentials by 10 a.m. Oct 30. New international media accreditation for this event is closed. Reporters must apply for credentials online at https://media.ksc.nasa.gov. For journalists unable to attend the event, NASA and partner organization managers will hold a media teleconference at 12 p.m. To participate, journalists must RSVP to Amber Philman at amber.n.philman@nasa.gov by 9 a.m. Oct. 31 to receive the call-in number and pass code. Reporters must call into the teleconference by 11:50 a.m. to join. Audio of the teleconference also will be streamed over the Internet from NASA's website at http://www.nasa.gov/newsaudio. For NASA TV downlink information, Video File schedules and links to streaming video, visit http://www.nasa.gov/ntv. WASHINGTON -- NASA is seeking proposals from educators who are looking for a unique way to inspire the next generation of explorers. Formal and informal education organizations can apply to host live interactive education downlinks with astronauts onboard the International Space Station. Proposals are being accepted for downlink opportunities during space station missions scheduled for March to September 2012. The deadline to submit comprehensive proposals that target a large number of participants is Dec. 21. During Expeditions 31 and 32, NASA crew members Don Pettit, Joseph Acaba and Sunita Williams will participate in the 20-minute downlink opportunities. Participants on Earth see and hear the crew members live from space, while the crew hears the questions but does not see the audience. U.S. educational organizations such as school districts, museums, science centers, national and regional education organizations and local, state and federal government agencies are eligible to participate. NASA provides this opportunity at no charge to the host institution. NASA personnel will work with the organization to help plan the event. "Educational downlinks provide unique opportunities for students around the country to learn more about living in space and exploring beyond Earth's boundaries," said Cindy McArthur, Teaching From Space project manager at NASA's Johnson Space Center in Houston. The downlink opportunities are broadcast live on NASA Television and are streamed on the NASA website. Due to the nature of human spaceflight operations, organizations must demonstrate the flexibility to accommodate changes in downlink dates and times. Participating organizations also must have two dedicated phone lines and be able to receive NASA TV via NASA's Live Interactive Media Outlet, or LIMO, channel in order to communicate with and view the crew. These educational opportunities are made available through Teaching From Space, a NASA education initiative. Interested organizations should contact Teaching From Space to obtain information related to expectations, content, format, audience, proposal guidelines and forms by sending an e-mail to JSC-Teaching-From-Space@mail.nasa.gov or by calling 281-244-7608. Teaching From Space will hold several online information sessions designed to provide more information about downlinks and the proposal process. For more information on the initiative, visit http://go.usa.gov/Xqt. For more information about NASA's education programs, visit http://www.nasa.gov/education. If you're into military technology you'll also love the latest police technology! California night owls got to see an amazing streak of light zip across the sky early Friday morning. It was a weather satellite on it’s way to space to collect data on both long-term climate change and short-term weather conditions. 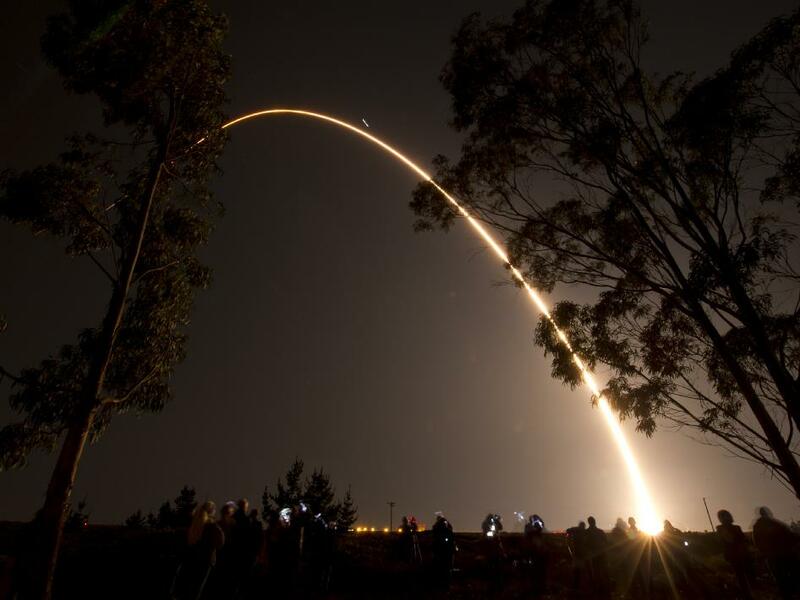 Airmen at Vandenberg Air Force Base in California launched the Delta II rocket carrying NASA’s NPOESS Preparatory Project (NPP) satellite from Space Launch Complex-2W at 2:48 a.m. PDT today. NPP, an Earth-observing satellite, represents a critical first step in building the next-generation of U.S. polar-orbiting climate and weather monitoring spacecraft. 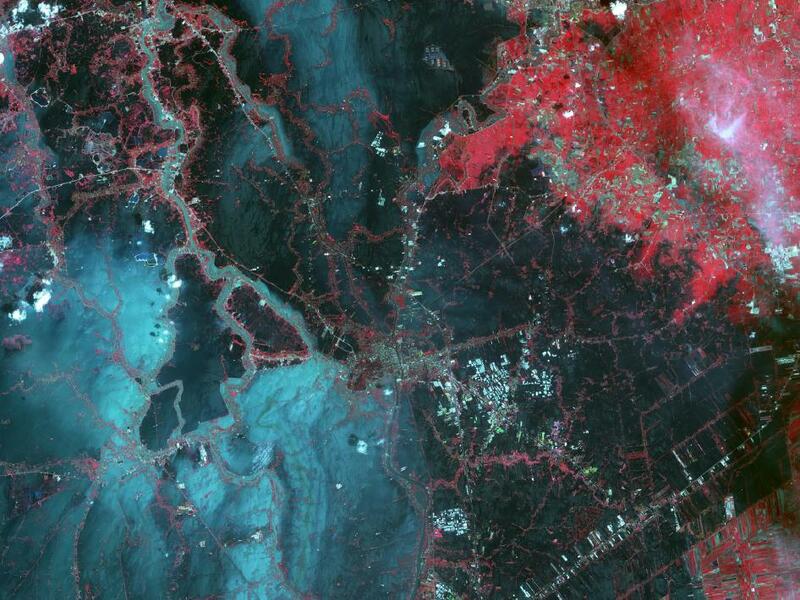 NPP is the bridge between NASA’s Earth Observing System (EOS) satellites and the forthcoming series of Joint Polar Satellite System (JPSS) satellites. The mission will test key technology and instruments for the JPSS missions. Today’s launch is the last scheduled for 2011 from Vandenberg. I have said throughout my tenure as your 36th Surgeon General that medical research and development is crucial to future capability of our armed forces because, more often than not, our medical innovations derive from an idea or experiment in one of our laboratories. Researchers and scientists epitomize the spirit of interdisciplinary scholarship, innovation, and entrepreneurship that lead to translational advancements in critical areas. Our global research and development arm is dedicated to enhancing the health, safety, readiness and performance of Navy and Marine Corps personnel deployed around the world through cutting edge medical research in a wide range of disciplines. Today we are fortunate to have eight extremely capable Naval Medical Research Centers, Labs, or Units spanning four continents that conduct basic and applied research in infectious diseases, biological defense, combat casualty care, military operational and expeditionary medicine, bone marrow transplantation, aviation medicine and medical standards, and diving and environmental medicine. I am also very proud of the bilateral agreement and Memorandum of Understanding for military medical partnerships we recently signed with the Vietnamese Ministry of Defense which will increase our medical knowledge and capability in the Pacific for the health benefit of both our nations and the entire Pacific Rim. Here is a quick snapshot of our global medical R&D capability with a summary of their areas of focus. ■Naval Medical Research Center – Silver Spring, Md. serves as our headquarters, focusing on solutions to operational medical problems such as battlefield neurotrauma and wounds, decompression sickness, naturally occurring infectious diseases, biological threat agents and bone marrow injury research. ■Naval Health Research Center – San Diego, Calif. works closely with operational units by conducting medical modeling & simulating analysis; monitoring the effects of combat exposure on psychological health; managing career-span deployment health & readiness programs, improving warfighter performance, and assisting in the implementation of military-specific HIV-prevention. ■Naval Submarine Medical Research Laboratory – Groton, Conn. conducts research into undersea human systems integration, submarine survival & rescue, diver bio-effects, hearing conservation, and situational awareness. They work in concert with the Naval Undersea Warfare Center, Naval Medical Center San Diego, NASA, NAVSEA, Naval Expeditionary Diving Unit, and the U.S. Army Research Institute of Environmental Medicine and others. ■Naval Medical Research Unit – San Antonio, Texas conducts medical, dental, and directed energy biomedical research to enhance the health, safety, performance, and operational readiness of Navy & Marine Corps personnel as well as addressing emergent medical and dental problems in routine and combat operations. ■Naval Medical Research Unit – Dayton, Ohio conducts research in acceleration effects, aviation medical standards and personnel selection, physiological and cognitive effects of altitude, vision research, pulmonary health effects, neuro-toxicology/ neuro-behavior, reproductive health and systems biology. ■U.S. Naval Medical Research Unit 2 Pacific – Pearl Harbor, Hawaii conducts infectious disease research and surveillance in South Asia and Southeast Asia. Current studies include respiratory disease surveillance, malaria drug resistance, novel vector control measures and dengue cohort monitoring. ■U.S. Naval Medical Research Unit 3 – Cairo, Egypt conducts infectious disease research and surveillance in the Middle East, Southwest Asia, Africa, & Eastern Europe. Current studies focus on influenza-like illness, acute febrile illness, diarrheal diseases, hemorrhagic fever, HIV, meningitis and infection control. ■U.S. Naval Medical Research Unit 6 – Lima, Peru conducts infectious disease research and surveillance in South America including prevention strategies, clinical trials, chemotherapeutics, diagnostics, epidemiology, and ecology. Researchers partner with the Peruvian Army and Navy, prestigious universities like Cayetano-Heredia and San Marcos, the Ministry of Health, USAID, CDC, NIH and several American universities. As part of research studies and directly through funding by such distinguished partners as the CDC, USAID, Department of State and many others, our laboratories provide medical diplomacy through improving civilian public health, infection control, and laboratory capacity building and I couldn’t be prouder of their efforts. While working to enhance US and global public health is certainly an important mission for our research laboratories, their primary mission is maintaining a high state of readiness for our warfighters. Readiness ensures we provide care for our people no matter where they are and no matter the situation they’re in. Vice Adm. Adam M. Robinson Jr is the 36th Surgeon General of the U.S. Navy and the Chief of the Navy Bureau of Medicine and Surgery. 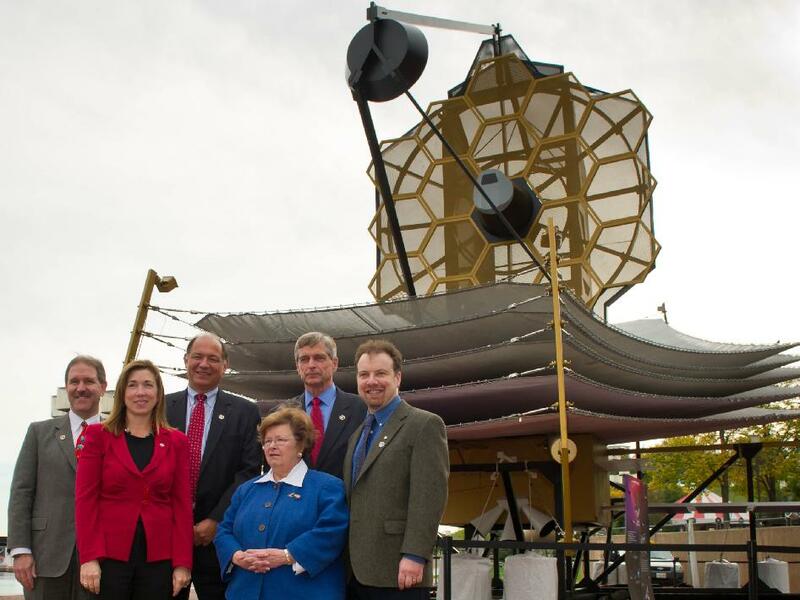 NASA, space science industry and government officials are seen in front of a full-size model of NASA's James Webb Space Telescope at the Maryland Science Center in Baltimore, Wednesday, Oct. 26, 2011. From left, back row are: Dr. John Grunsfeld, former astronaut and Deputy Director, Space Telescope Science Institute (STScI), Baltimore; Jeffrey Grant, VP and General Manager of the Space Systems Division, Northrop Grumman; Van Reiner, President and CEO of the Maryland Science Center, Baltimore and Adam Reiss, recipient of the 2011 Nobel Prize in Physics and professor of astronomy and physics at Johns Hopkins University. In the front row are NASA Deputy Administrator Lori Garver, left, and U.S. Senator Barbara Mikulski (D-Md.). Interested in planetary and stellar science? See these NASA books written by military heroes who served as NASA astronauts. 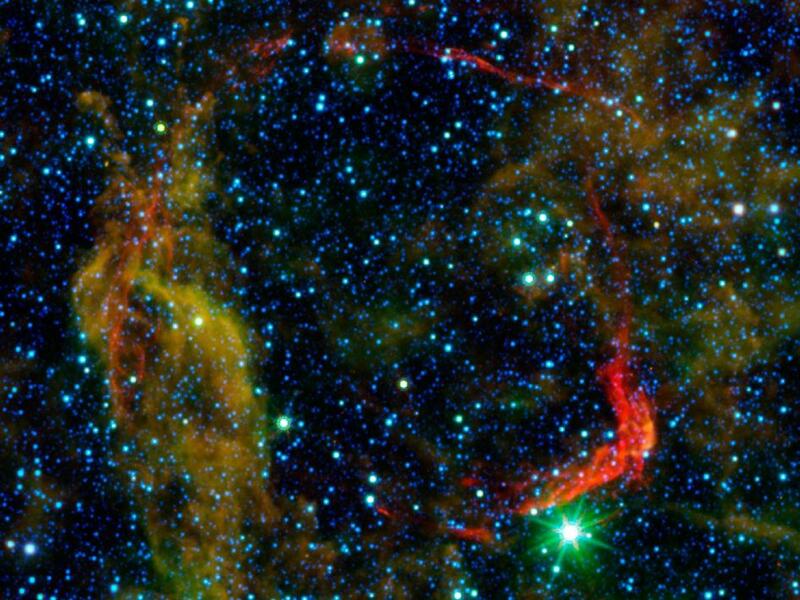 Infrared images from NASA's Spitzer Space Telescope and the Wide-field Infrared Survey Explorer, or WISE, were combined in this image of RCW 86, the dusty remains of the oldest documented example of an exploding star, or supernova. It shows light from both the remnant itself and unrelated background light from our Milky Way galaxy. The colors in the image allow astronomers to distinguish between the remnant and galactic background, and determine exactly which structures belong to the remnant. Dust associated with the blast wave of the supernova appears red in this image, while dust in the background appears yellow and green. Stars in the field of view appear blue. By determining the temperature of the dust in the red circular shell of the supernova remnant, which marks the extent to which the blast wave from the supernova has traveled since the explosion, astronomers were able to determine the density of the material there, and conclude that RCW 86 must have exploded into a large, wind-blown cavity. The Child ID app can be downloaded for free HERE. In response to user feedback, the FBI Child ID App has been updated with new features, including password protection and additional photo capabilities. To download the update, go to the iTunes store and click on the Apps button. The iPhone mobile application, which enables users to electronically store photos and vital information about their children so that it’s handy if they need it, was launched on August 5 and has been downloaded more than 80,000 times. Passwords: You now have the option of password-protecting the application. To activate it, go to the Checklist screen, click on the Password icon in the upper right hand of the page, and select Enable Password Protection. If you use this feature, remember to update your password often and make it something you will remember if you need it. The passwords rely on the iPhone’s built-in keychain and encryption features. Photos: You can now add any pictures from your iPhone’s image library (before, you needed to take a picture with your iPhone to add it to the app). You can also zoom in and crop images prior to saving. Other additions include new icons and styles, smarter keypad input fields, and data protection that prevents you from losing unsaved data should the application be closed before saving. With the Child ID App, you can quickly share pictures and physical identifiers such as height and weight with security or police officers. And using a special tab on the app, you can quickly and easily e-mail the information to authorities with a few clicks. Ames Research Center, Moffett Field, Calf. MOFFETT FIELD, Calif. -- NASA has released an interactive, educational video game called NetworKing that depicts how the Space Communication and Navigation (SCaN) network operates. The release of the video game coincides with the close of World Space Week, Oct. 4-10. Developed by the Information Technologies Office at NASA's Ames Research Center at Moffett Field, Calif., NetworKing gives players an insider's perspective into how astronauts, mission controllers and scientists communicate during space missions. "For any young person who ever dreamed of one day contributing to space missions, NetworKing lets players develop a kingdom of multiple space communication networks working together to support space missions," said Barbara Adde, policy and strategic communications director for SCaN at NASA Headquarters in Washington. "As a simple and fun introduction to the complex world of space communications, NetworKing gives players the opportunity to enjoy a challenging game while absorbing the basic concepts of space communication," said Daniel Laughlin, games researcher at NASA’s Goddard Space Flight Center in Greenbelt, Md. "It's an engaging way to increase interest in science, technology, engineering and mathematics areas of study and open minds to potential careers in those fields." NetworKing is available to the public for play on the NASA 3D Resources website. Players can access the game using an Internet browser. It can be downloaded and run on both a PC and Macintosh operating system. To play the NetworKing game, visit http://www.nasa.gov/multimedia/3d_resources/scan.html. Declared by the United Nations General Assembly, World Space Week is an annual international celebration of science and technology commemorating the launch Sputnik 1, the first human-made Earth satellite, and the signing of the Outer Space Treaty. The theme for World Space Week 2011 is "50 Years of Human Spaceflight." For more information about World Space Week, visit http://www.worldspaceweek.org/. 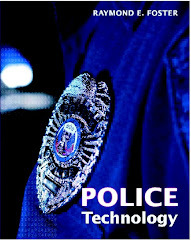 If you're a fan of military technology you'll also like police technology! With the possibilities of concussion, neurotoxin exposure and post-traumatic stress disorder among service members, the need for accurate and widespread assessment of brain function is critical. An individual’s performance on standardized cognitive tasks can reveal the extent of injury, even when other signs and symptoms are not immediately apparent. This enables healthcare staff to start treatment earlier, monitor its effectiveness more closely, and make more accurate return-to-duty decisions. Participants at a national workshop on the biological assessment of brain dysfunction held last spring discussed recent advancements in neurocognitive testing, including the use of virtual reality. The event was funded by the U.S. Army Medical Research and Materiel Command’s Telemedicine and Advanced Technology Research Center, or TATRC. Workshop co-chair and TATRC director Col. Karl Friedl noted that cognitive assessment must become unobtrusive and even fun. “If it’s fun, individuals will be more motivated and the results could be more accurate,” he said. Dr. Jennifer Vasterling, chief of psychology at the VA Boston Healthcare System and professor of psychiatry at Boston University, presented an overview of cognitive abnormalities associated with post-traumatic stress disorder, or PTSD reactions. She explained that cognitive testing can illuminate specific functionally relevant difficulties so healthcare professionals can identify other problem areas, in addition to emotional symptoms, to target in treatment. She discussed exposure therapy as one example. “Perhaps research on memory and other cognitive functions important to the process of change in this and other PTSD interventions could help us augment the interventions so they are more effective for people with a cognitive impairment,” she said. For cognitive assessment, the military currently uses paper-and-pencil tests as well as the Automated Neuropsychological Assessment Metrics, or ANAM, computerized test. Workshop co-chair Dr. Robert Kane, project manager for the Neurocognitive Assessment Tool Program at the Defense and Veterans Brain Injury Center, shared findings related to concussion. He noted the importance of cognitive tests, citing studies showing that such tests detected concussion effects in individuals even after they reported themselves to be symptom free. Kane said that computerized tests seem to provide more detail than traditional ones, thus illuminating different cognitive effects stemming from different types of concussion. “An emerging pattern of evidence shows that loss of consciousness is a determining factor in the type of cognitive issues resulting from a concussion,” he added. While the ANAM has been a helpful tool for gathering data in the military, some workshop participants felt that it needed additional research to back it up. This would be particularly important in advancing it as a standard measure that the civilian community might also adopt to evaluate cognitive functioning. Col. James Ness, the new director of the Engineering Psychology Program in the Department of Behavioral Sciences and Leadership at West Point, indicated he plans to develop a team of faculty and cadet researchers to examine and scientifically evaluate the ANAM. “We’d also like to explore additions such as virtual reality, which is perfect for today’s video game generation,” he said. Ness believes virtual reality, or VR, could have been a useful tool in the medical training he conducted during his recent deployment as command inspector general with the NATO Training Mission/Combined Security Training Command in Afghanistan. Several at the workshop shared Ness’s enthusiasm about potential VR applications to cognitive assessment and training. Dr. Thomas Parsons, director of the NeuroSim Laboratory at the University of Southern California’s Institute for Creative Technologies, is developing and testing VR assessment tools for return-to-duty decisions after brain or psychological injury. With Soldier input, his team has recreated multi-sensory environments and situations from Iraq and Afghanistan, including patrolling in a Humvee or on foot, and witnessing varying levels of environmental stressors, such as improvised explosive device, or IED, explosions, rocket-propelled grenades, bomb blasts and insurgent gunfire. The team has worked with other partners (military and civilian) to compare their test results with standardized paper-and-pencil tests as well as ANAM results. “My focus is on validating this technique, working with both clinical and nonclinical populations, so it can become standardized and accepted as a way to add further information to the current tests we have,” Parsons said. Parsons’ team is also using eye tracking, psychological measures, and physiological measures such as cardiovascular reactivity and EEG to refine the virtual environments. One goal is to discover the optimal intersection of performance and stress level–if the environment is not arousing or the cognitive task is too simplistic, then the user becomes bored and disengages. On the other hand, if the environment is overstimulating and too complex, then the individual becomes overwhelmed and frustrated. Hence, the goal is to adapt the assessment relative to the user’s optimal performance. Through this extensive testing and refinement, the Virtual Reality Cognitive Performance Assessment Test, or VRCPAT 1.0, has evolved into VRCPAT 2.0 for Adaptive Training. This tool is part of a stress prevention project in which a virtual mentor guides individuals through traumatic episodes pre-deployment, providing coping strategies that may lessen the emotional damage from soldiers’ actual experiences in theater. The next iteration, VRCPAT 3.0, is now in development for team cognition and Mobile Counter-IED Interactive Training. In another application of the technology, Dr. Albert “Skip” Rizzo, associate director of the Medical VR Research group at the USC Institute for Creative Technologies, is using a Virtual Iraq/Afghanistan environment similar to that used for VRCPAT to deliver exposure therapy for combat-related PTSD. He noted that a 2008 meta-analysis (Parsons and Rizzo) found that VR outperformed traditional exposure therapy for phobias, while another study found that it led to greater improvement in post-9/11 PTSD symptoms than traditional therapy. Rizzo’s and others’ initial pilot clinical trials have shown that therapy with Virtual Iraq may achieve better results than traditional therapy, with a lower dropout rate. These findings suggest that being immersed (safely and gradually) in a simulated stressful experience could be more effective, and perhaps more engaging and acceptable to those raised with video games, than simply asking the patient to imagine the scene. However, Rizzo noted that randomized controlled trials would be needed to support this claim. Three such trials are ongoing. Rizzo, lead investigator JoAnn Difede, and partnering investigator Barbara Rothbaum have recently begun a three-site randomized clinical trial of VR exposure therapy’s ability to reduce PTSD symptoms compared to traditional imaginal exposure therapy. The trial is also testing whether the use of D-Cycloserine, a medication that affects emotional processing in the brain, improves results of the therapy when taken during the exposure sessions. To better objectify the outcome measurement in this study, they are using a sophisticated “startle response” conditioning/extinction paradigm. “The startle reflex is a good indicator of PTSD because it is often amplified in these individuals and fails to extinguish as is typical with those not experiencing PTSD,” said Rizzo. These examples are just a few of the exciting efforts in both the military and civilian research communities to improve the care of our deployed service members and veterans. Successfully preventing, identifying, and treating brain and psychological injury will be vital parts of this improvement. TATRC fosters research on health informatics, computational biology and other key medical technology areas. For more information on TATRC’s research funding and collaborative opportunities, visit TATRC.org. GUANTANAMO BAY, Cuba (NNS) -- Throughout the month of October, Naval Station (NS) Guantanamo Bay, Cuba is observing Energy Awareness Month which runs from Oct. 1-31, on base. This year's Energy Awareness Month themed, "Turn Words into Action; Turn Action into Results," promotes energy conservation for base residents. The naval station is currently constructing a solar farm that is approximately the size of a football field. It will provide electricity for the expansion of Denich Gym at the Cooper Field sports complex. "The gym solar array will provide power directly to the gym for operation, reducing the amount of power that needs to be produced by the diesel generators," said Wagoner. "The gym solar array will use photovoltaic (PV) panels; PV is a method of generating electrical power by converting solar radiation into direct current electricity which is then converted to alternating current that can be used by the facility." The implementation of solar technology will be valuable to the naval station as using alternative, renewable energy sources. It will also reduce the cost and emissions that result from producing electricity using diesel generators. "This solar array is important to the base because it will be the first large scale solar array on the station and will show the possibilities of solar power on the station," said Wagoner. "The use of alternative energy sources is extremely important for the base to provide energy security to it. Currently with the diesel generators, we are completely dependent on the fuel that is delivered to the station." Another example of new solar technology at GTMO is the recently installed perimeter lighting on the leeward side of the naval station. "The solar perimeter lights will reduce our electrical consumption by running off of batteries at night that are charged by solar panels during the day which reduces the amount of power that needs to be produced by diesel generators," said Wagoner. Other recent equipment added to the naval station's inventory to make the base more energy efficient includes LED street lighting and two 3.5 megawatt generators. "The LED lights are approximately 75 percent more efficient than their mercury vapor and high pressure sodium counterparts which results in less power that has to be produced by the diesel generators," said Wagoner. "The new generators have an increased efficiency, which means that it takes less diesel fuel to produce the same amount of power as the old generators." "GTMO is an isolated base and produces all of its own electricity and water," said Tim Wagoner, NS Guantanamo Bay's resource efficiency manager. "It is everyone's responsibility to conserve whenever possible." Secretary of the Navy Ray Mabus laid out five aggressive energy goals in October 2009 to improve energy security and efficiency, increase energy independence, and help lead the nation toward a clean energy economy. This initiative assists in achieving the energy goal of increasing alternative energy afloat and ashore where by 2020, the Department of the Navy (DON) will produce at least 50 percent of shore-based energy requirements from alternative sources and 50 percent of DON installations will be net-zero. HOUSTON -- NASA Television will provide live launch coverage of a Russian Progress cargo spacecraft on Sunday, Oct. 30, from the Baikonur Cosmodrome in Kazakhstan. NASA TV coverage will begin at 5 a.m. CDT, with launch scheduled for 5:11 a.m. (4:11 p.m. Baikonur local time). The International Space Station (ISS) Progress 45 spacecraft will deliver almost three tons of food, fuel and supplies to the space station three days later. This will be the first launch of a Progress vehicle and its Soyuz booster since the ISS Progress 44 vehicle was lost on Aug. 24 due to a third stage engine failure. Expedition 29 Commander Mike Fossum and Flight Engineers Satoshi Furukawa and Sergei Volkov will monitor the spacecraft's automatic docking to the station's Pirs Docking Compartment at 6:40 a.m. on Wednesday, Nov. 2. NASA TV coverage of docking will begin at 6:15 a.m. on Nov. 2. The undocking of an older resupply ship, ISS Progress 42, from the Pirs docking port on Saturday, Oct. 29, will not be broadcast live. WASHINGTON -- NASA will host a series of news briefings from Vandenberg Air Force Base in California on Wednesday, Oct. 26, from 4 to 6 p.m. EDT, to discuss the agency's next Earth-observing satellite science mission. The National Polar-orbiting Operational Environmental Satellite System Preparatory Project (NPP) is scheduled for launch from Vandenberg on Friday, Oct. 28, during a nine-minute, 10 second window that opens at 5:48 a.m. NPP will collect critical data to improve our understanding of long-term climate change and short-term weather conditions. The second of NASA's Educational Launch of Nanosatellite (ELaNa) missions also will launch with NPP aboard a Delta II rocket. - Tim Dunn, NASA launch director, Kennedy Space Center, Fla.
- Vernon Thorp, program manager, NASA missions, United Launch Alliance, Cape Canaveral, Fla.
- Ken Schwer, NPP project manager, Goddard Space Flight Center, Greenbelt, Md. - Mitch Goldberg, NOAA Joint Polar Satellite System program scientist, Silver Spring, Md. The briefings will be carried live on NASA Television and the agency's website with question-and-answer capability available from agency field centers. Reporters also may email questions for participants during the briefings to Steve Cole at: stephen.e.cole@nasa.gov Emailed questions must include the journalist's name, affiliation and a contact telephone number. For NASA TV streaming video, downlink and scheduling information, visit http://www.nasa.gov/ntv. For more information about the NPP mission, visit http://www.nasa.gov/npp.